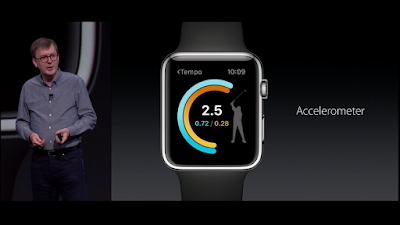 Apple Watch Can Now Be Used As A Wii Controller For Apple TV. When accelerometer was introduced in Smartphones it opened up whole new possibilities for developers as they could achieve something that was not previously possible. Speaking of the accelerometer in particular means, those tilts or shakes that we normally do while playing games like Nfs Most Wanted, Real Racing 3 etc. This nifty little thing, simply extends our Smartphone's use into a real world experience. This is already accessible on iOS and Android devices. Some developers have created few amazing apps where, your Smartphones can be used as actual controllers when hooked up to a TV via Chromecast on Android OR Airplay on iOS, in short by accessing wireless display by WiFi connection! Which was awesome, but recently Apple showed some improvements to the Apple Watch coming with Watch OS 2, as now It will run Native Apps. Apple even showed something that only quite few noticed as an opportunity for their own apps, which was the use of Accelerometer from Apple Watch ! 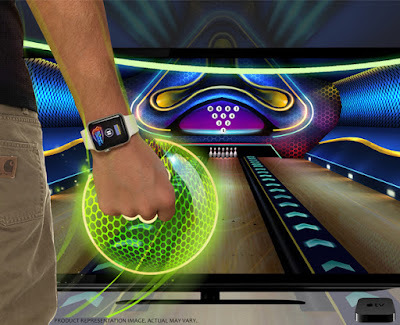 Developers from Rolocule are already testing an update for their game: Bowling Central, where you can control your bowl with your Apple watch( functionality similar to PlayStation, Wii-controllers) on Apple TV. Now you can have real life gaming experience with Apple watch, that previously you could possibly do via any iOS device. Finally there's an implementation, that I've been looking for since the day, Smartwatch (Any Platform) has launched, rather than dismissing notifications ! Spoiler : Simply consider = VR headset + Apple watch !! Infinite possibilities, isn't it ?! Devs mark that up, quick ! So Is it exclusive to iOS? Just so that you might be wondering its a feature exclusive to iOS & stuff? stomp onto brake pedal because Android Wear already got that back in March with their Tennis game(Rolocule). Rolocule wants everyone to enjoy this feature as they're first in iOS, they're not leaving a chance to win at this, hence they've made this game free, instead of the previous 2.99$ price tag. They've also added multiplayer support, so now you can add multiple phones while connected to Apple TV as individual controllers. Watch OS 2 really is giving developers flexibility to create something great from such a tiny wearable device, which is incremental & definitely awesome! Also See : Apple's Watch OS 2 : Explained !